Need a translation in the Life Sciences fields? Ask for a quote now! Companies operating in all sectors of the medical industry are well aware of the importance of accurately interpreting clinical trial results in order to obtain international regulatory approval for their drugs and medical devices. Since many of these trials and studies are conducted in foreign languages, it becomes crucial that the results are accurately translated back into English and any other required languages. MedDRA, or the Medical Dictionary for Regulatory Activities, is designed to be the global standard for medical terminology and product development processes for the global market. The U.S. FDA has implemented MedDRA to help define its Adverse Event Reporting System (AERS) while European authorities use MedDRA as a key part of their electronic database systems. When the MedDRA database first debuted, it only provided multilingual terminology for six languages: English, German, Spanish, French, Portuguese, and Japanese. 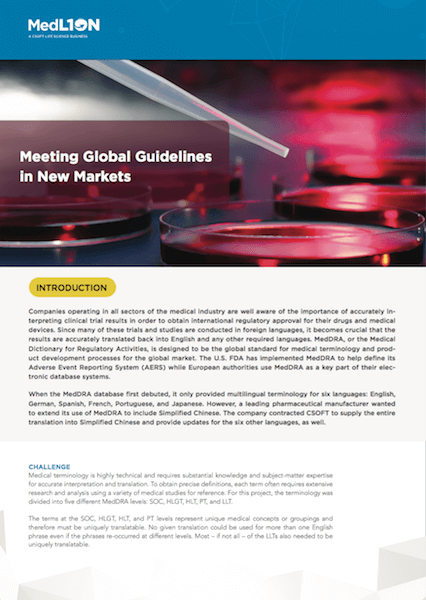 However, a leading pharmaceutical manufacturer wanted to extend its use of MedDRA to include Simplified Chinese. The company contracted MedL10N to supply the entire translation into Simplified Chinese and provide updates for the six other languages, as well. Please fill in your email address to download our Case Study. Thank you! Your file is ready for download.